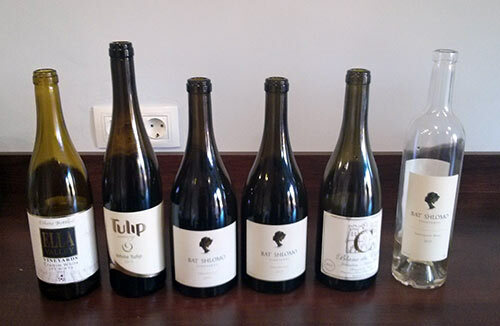 Back in March, I was invited by Kinetis for a tour of Israeli wines. I happily accepted and spent a week jamming around every corner of the country to see what they offered given that Israel is ironically an old New World wine region and thus, very curious. I liked what I saw well enough to request some bottle samples and share them with wine writers, sommeliers, and wine makers back home here in Catalonia. After jockeying around days and getting through the black hole of time that is August in Spain, we finally did the tasting recently and it was interesting to hear other perspectives as well as re-taste these wines with more time given that we tasted about 150 different wines in short week spent in Israel. I can’t remember the percentage of whites made in Israel, but they make a great deal of them even though from what I saw, it’s a region better suited to reds. Still, they don’t do badly and we tasted: Bat Shlomo Sauvignon Blanc 2013, Chardonnay 2012 & 2013, Domaine du Castel Chardonnay 2012, Tulip White Tulip 2013, and Ella Cramim White 2012. The Ella was okay, boasting a good deal of crisp acidity, but not a great deal of depth. The Tulip was similar although a bit sweeter overall–it’s important to note that the wines of this winery are very popular in Israel due to this style. Domaine du Castel was showing much better than when I last tasted it, but it’s the New World style of Chardonnay which I don’t care for with a good deal of French oak and malolactic fermentation. If you like that, then this is for you. But overall, the Bat Shlomo were the crowd pleasers. The 2012 and 2013 Chardonnays are markedly different from one year to another. I still like the 2012 as much as I did when tasting it in Israel. The 2013 needs a little more time to settle in the bottle, but is indeed promising as well. The Sauvignon Blanc was very popular. My friend David of Vinificats was especially taken with it. The reds were overall quite solid. We tasted: Bravdo Shiraz 2012, Flam Cabernet Sauvignon Reserve 2010, Domaine du Castel Grand Vin 2011, and Bat Shlomo Betty’s Cuvee 2012. The Bravdo suffered from the same problems as when I’d tasted it in Israel. It’s a thin wine that while made well is sourced from vines that are flat-out overproducing in much the same way that the vineyards of Penedès do here in Catalonia. If they pruned back it would provide wines that are a great deal more interesting. The Flam wine was surprisingly good and robust. Despite the fact that the winemaker is emulating the styles that he’s picked up in his travels, it’s a solid, tasty wine. The real surprise was the Domaine du Castel. When tasting it in Israel, I simply didn’t care for it. 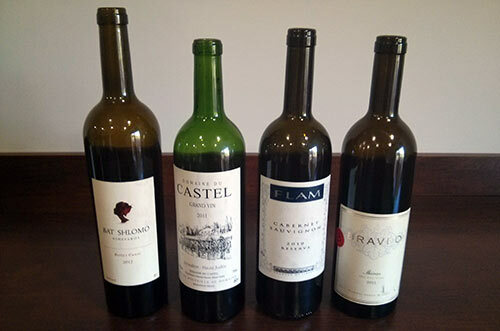 This re-tasting showed a very, very nice rounded wine with good balance to it. That was a pleasant surprise. As with the whites, the Betty’s Cuvee from Bat Shlomo was quite good as well. Given that we tasted a tank sample in Israel, it was nice to taste the final product. Very good wine and it contributes to Bat Shlomo having one of the best overall lines of wines of anything we tasted while in Israel. Again, in conclusion, there are indeed good wines coming out of Israel. Oddly enough, everything in this batch happened to be Kosher, but to re-emphasize, Kosher wines are only 50% of those produced in Israel. The only problem for those of us here in Spain was the price point as similar levels of wine are at least half the price of what these wines cost. Of course for the group in attendance, I had to point out that it’s just damned expensive to do anything in Israel which is another reason why again, I was thankful for the invitation from Kinetis.